This is the first tool in a series of tools I plan on making in my machine shop class at the College of Marin. I purchased the tube centering cones off of eBay (listed as motorcycle frame jig cones). Its purpose will be to align the headtube against a 24″ x 36″ granite surface plate I purchased a while back (which allows you to work on only one triangle at a time). It’s about 11″ long with 3/4″ – 16 threads. 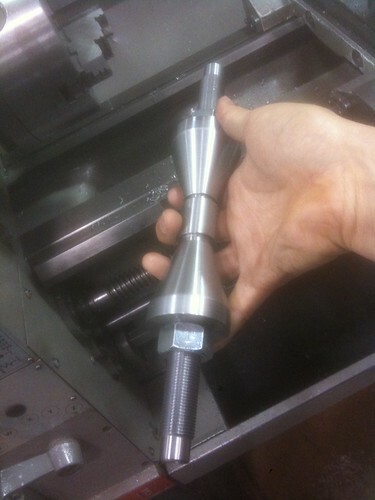 I machined two smooth surfaces on either end that are within 0.001″ of each other in diameter. I figure if I get two v-blocks that are the same dimensions, it should put the headtube parallel to the surface plate. I plan on having a hole drilled into the surface plate so I can make and mount a bottom bracket post. Then I will either need to create v-blocks to account for each tube’s width in relation to the bottom brackets center line or I will need to make some adjustable v-blocks (which I’m not so sure will be easy to do). I’m going to have a go at making a frame jigless with only the surface plate, some pins, lugs, v-blocks, and mounting points. I’m pretty sure it can be done…I think.